Happy Hump Day! 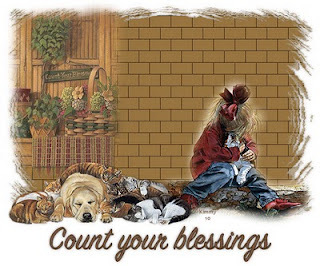 Remember to Count Your Blessings. Welcome to LilacsNDreams everyone, and glad to have you visiting. I do believe this week has become some sort of a slack off week for me. Ever get those yourself? Not that anything has gone bad, or that everything is all good, but sometimes we just need those. Don't you think? I have taken pictures of items, revised them, need to put them into listings at the shops, have been listing a little bit, and doing some relisting, and of course revising some of my listings too. Doctor appointment again yesterday....nothing serious. Just something that has pretty much come to me over time, and become a usual routine....most of the time anyway:) Did a little bit of research on items before I pictured a few of them to see if I should list them, or not. Just that kind of week so far. But, I had to come by here, leave a note with ya'll, and let you know I am still here. I have gotten into a routine of making my blog posts for ya'll to visit with, and I feel like I am forgetting something if I do not get by here to do what I have scheduled for me to do. Yes, blogging has become a part of my ritual, my routines, and I enjoy it too. Gives me a little time to share things I know, things I read, share opinions with things, make some new friends, and of course I enjoy hearing from everyone too. After watching some things on tv, and reading on the internet I realized I have things good compared to some people. You know they say not to dwell on what you don't have, but to be thankful for what you do have. Even though we do not see it ourselves, we are actually rich in many ways that others would like to have, and dream of. Society has changed so much over the years, and it is so darn hard to do anything good without wondering if it is a scheme, am I being played, is it a worth while cause, where is my money actually going, etc. I enjoy handing money to someone I see on the street if they need it. I enjoy giving money, and actually giving many things into donations because I always felt if something happened that I would need it some day....I sure hope people could be there for me as well, and donating too. Instead many people just stare at those who are trying to get some money to eat, feed their kids with, and find some shelter. Many times people in need are ignored, looked down upon, and talked about too. Sadly, we cannot blame them fully till we know their stories. Some of us might be surprised to find out that some of these people use to have great paying jobs, had homes, wore beautiful clothes, and some of them even had more than we have ourselves. For reasons unknown, or out of their control they lost everything, and have come to things like we see today. As I have always told my kids as they were growing up, Please do not judge someone by what you see until you know more. And, the next time you want to complain that you don't have anything....think about them words, and know what they really mean. In all reality you are rich compared to someone who has nothing. So, this is my thought, and feeling for the day I wanted to share with all of you. I do hope that all of you had a great weekend, and the week has been good to you so far. Hang in there now....the weekend is almost here again...WooHoo! Thanks again for visiting, and sharing your time with LilacsNDreams everyone. Hope to see you again soon. Take care, and Happy Hump Day! !